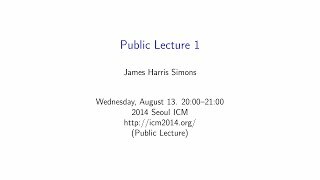 James Harris Simons (born 1938) is an American mathematician, hedge fund manager, and philanthropist. He is known as a quantitative investor and in 1982 founded Renaissance Technologies, a private hedge fund based in New York City. Although Simons retired from the fund in 2009, he remains its non-executive chairman and adviser. A speech and Q&A with billionaire and the second richest hedge fund manager in the world, Jim Simons. In this speech James talks about his life, career and the events that lead him to starting Renaissance Technologies. James also goes on to speak about why Renaissance technologies is so successful and his guiding principles for life.<br>Video Segments: <br>0:00 Introduction <br>4:25 Early Life <br>8:04 MIT <br>10:35 Road trip to South America<br>12:18 Berkley <br>13:18 First investments<br>18:20 Urge to do something different/First business<br>20:26 Back to academia <br>26:09 Opposing the war/ Getting fired <br>30:45 Stony Brook University <br>36:26 Managing money <br>39:39 Becoming a trader <br>45:53 Renaissance technologies/ What makes it successful<br>49:40 Simons foundation <br>54:04 Mathematics as a refuge <br>55:40 Retirement <br>57:19 Guiding principles <br>1:00:45 Start of Q&A <br>1:01:12 When not to do something?<br>1:02:20 Thoughts on hedge fund industry today?<br>1:04:31 Why do you focus on collaborative goals?<br>1:06:30 How did your parents help foster your mathematical knowledge?<br>1:07:15 When you look back, would you change anything?<br>1:08:14 Do you think you should share your knowledge?<br>1:09:52 Thoughts on mathematics education?<br>1:17:55 Bourbaki movement? Jim Simons: My Life in Mathematics is an autobiographical story on a career in financial markets from one of the most successful hedge fund managers over the past 30 years. Many of the stories contain lessons that apply across a number of areas of life and markets.